Built 1894-1897 by Nicola Bagaglia. Opened 1 August 1897 as "Theatro Rainha D. Amélia", named in honour of Queen Amélia (1865-1951). 1915 renamed "Teatro Luíza Todi" in honour of the Portuguese opera singer, Luísa Todi (1753-1833). Demolished 1958 in favour of the new Fórum Municipal Luísa Todi. Reverse Text: "Interior do Teatro Luísa Todi (antigo Teatro D. Amélia) demolido em 1956. 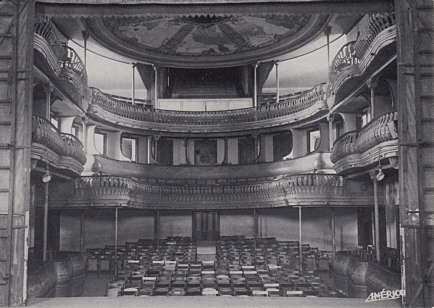 Interior of Luisa Todi Theater demolished in 1956."